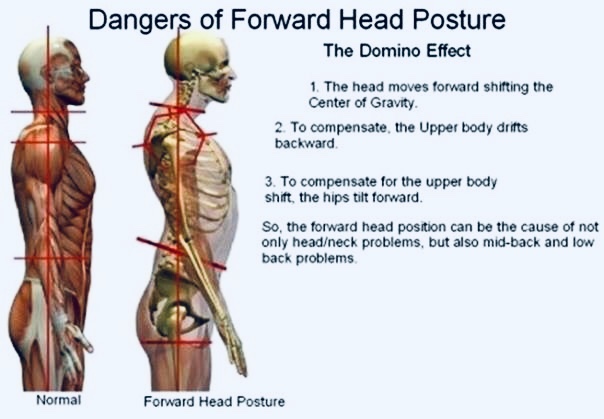 Thanks to computers, phones, and tablets, forward head posture has become a huge problem in America. I would say it probably puts 3/4 of the patients I see in my office. It doesn’t only cause neck pain, but it causes upper back and low back pain also- not to mention long-term degeneration of the spine. This can also be caused from motor vehicle accidents or any other traumas of day-to-day life. A lot of people even get missed diagnosed with carpal tunnel syndrome and it is nothing more than excessive strain on the bed to lower neck due to forward head posture. Just like our parents used to say, “ sit up straight! “ and make sure to get your spine checked by a chiropractor regularly.